SENDA distributes and sells dried pigs blood. It is a unique feeding raw material produced by Farpromodena SPA (Italy). The product conforms to the quality standards and we have all necessary supporting documents. 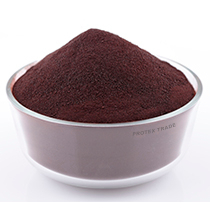 Blood cells (dried pigs blood) produced by spray-drying and fractionation can be used to partly or completely replace crude protein in the diet of poultry and livestock. This product is characterized by a unique amino acid composition and high content of crude protein - over 92%, which makes it a source of nutrients that satisfy the needs of the body of poultry and livestock. If necessary, we are ready to provide you with samples of dried pigs blood that will allow you to decide on the future purchase. To get a sample, please contact this area manager. Blood cells significantly reduce consumption and increase digestibility of fodders for poultry (geese, broiler chickens, laying hens), pigs, small ruminants and cattle. Livestock and poultry quickly gain weight due to the high content of protein and micronutrients. As a result, their immunity increases, bones and the hematopoietic system strengthen, as well as production costs reduce significantly.